Protestors outside of police headquarters after body cam video show officer tasing man 11 times. GLENDALE, AZ — An Arizona man did nothing to provoke repeated shocks with a stun gun during a 2017 traffic stop, said an attorney representing the man an excessive force lawsuit. Marc Victor said Monday that Johnny Wheatcroft was compliant and it was "egregious" that police in Glendale did nothing to stop the abuse. The lawyer spoke out a day after posting body camera footage from the encounter online. Wheatcroft, 39, was seated next to a friend who was driving to a motel on July 26, 2017, when police stopped them. Wheatcroft's wife, Anya Chapman, was in the backseat with the couple's two children. Officers pulled over the car because of a traffic violation and discovered the driver didn't have a license, according to police. Wheatcroft declined to show police his driver's license and questioned why he had to provide identification. 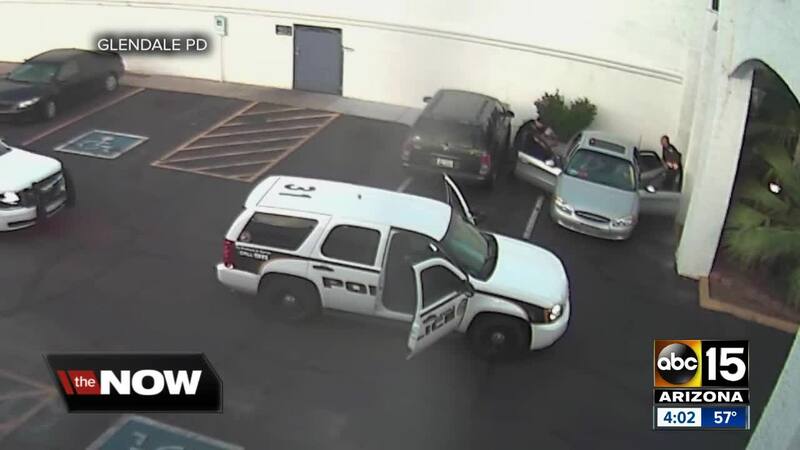 The body camera footage posted by Victor, and previously obtained by ABC15 , shows the incident quickly escalated with an officer pinning Wheatcroft's right arm back. According to police, Wheatcroft had reached down below his seat into a backpack. Wheatcroft "continued to argue, yell and physically resist the officers' control holds," according to a police statement. The video shows officers used a stun gun several times after Wheatcroft questioned having to provide identification. Victor has said his client was shocked 11 times. Chapman and a child in the backseat immediately start to scream. The child asks, "Daddy, are you OK?" An officer says Chapman then hit another officer in the head. Surveillance video released by police on Friday shows an officer getting hit in the face by a bag. Victor on Monday also posted a video of that injured officer, Mark Lindsey, being interviewed by police in a hospital. Victor says it shows the officer laughing off the incident. The seven-minute video begins with someone asking Lindsey what happened and the injured officer laughing while sitting up in a hospital bed. Lindsey then goes on to describe the traffic stop and how he was hit in the head by a white bag. "I found out that the white bag I was struck with was filled with soda bottles and soda cans were full," Lindsey says on the video. Chapman, who was 34 at the time, later pleaded guilty to an assault charge in the case. Lindsey also said on the video that he talked with the driver about Wheatcroft. "I asked him why he was being so confrontational with us. He wasn't sure why," Lindsey said. The Glendale Police Department said last week that a review of the officers' actions was already done one officer was disciplined "regarding certain tactics." The city is also named in the lawsuit.